Excitement surrounding new warehouse technology has been building for several years. Now, we’re reaching a stage where the devices and software that power the warehouse of the future are here, ready to be deployed today. The results so far are exciting, and shed light on a future of fulfillment logistics — a future that’s faster, safer, and cheaper than anything we could have imagined. 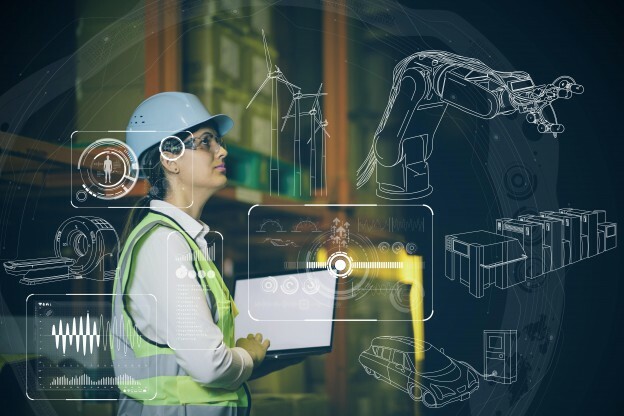 Here’s a sneak peek of new warehouse tech on the market: Hyperconnectivity RFID technology and IoT devices are powering futuristic product tracking and documentation capabilities that would have seemed like a dream less than a decade ago. Global companies like Decathlon are currently using RFID to improve inventory visibility for millions of individual products around the world. Cargo can now be tracked everywhere along the supply chain, from the container ship to the end user, then meticulously documented to prevent shrinkage. The digital connection between warehouse and retail shelf that Decathlon has enabled makes receiving shipments seamless, and integrated radio tech is being used to power loss prevention efforts. In the warehouse, RFID and IoT devices let operators know where product is during the fulfillment process, from picking to packing and out the door. Meanwhile, that data is fed into inventory management software, and used to create more efficient pick lists. When retailers know how much inventory is available, warehouse management software can automatically re-order product when a threshold is triggered. Plus, the consumer can access information on exactly where their product is and receive more accurate delivery estimates. Hyperconnectivity also enables temperature tracking for food and other perishable cargo. RFID chips designed to monitor sensitive product on warehouse shelves minimize mishandled pallets and reduce loss. One company using this technology, Eskimo Cold Storage, reports that RFID has prevented mishandling for 4000 pallets each year since implementation in 2014 — to the tune of more than $233,000 saved annually. Automated Picking Picking has long been one of the most time-consuming and labor-intensive aspects of operating a warehouse. When unemployment is low and labor costs rise, it quickly becomes one of the more expensive aspects as well. Robots that can pick product and deliver it for packing have long been part of the vision for the warehouse of the future. Now, companies are finding tech solutions that match their ambitions. Case in point, this video from Ocado, a UK-based online supermarket: These automated picking robots are 4G-enabled and connected to a central navigation system. Each is given a digital pick list, which directs the robot to the right product. Once the product is picked, it’s transported to human packers for processing and fulfillment. Automated pickers like these ones from FIEGE Logistik allow warehouses to increase clear heights, as the robots can access higher shelves without risking injury. Data generated from each order is fed into big data processing algorithms to establish more efficient routes. As more data is collected, routes are improved and robots are given more precise picking instructions. Rather than each robot optimizing itself, the system creates pathways that prevent collisions, and ensure the fastest possible picking time. Big Data Amazon has changed the size and speed of warehouses around the world. By positioning smaller warehouse “nodes” close to each major city, they’ve managed to cut fulfillment turnaround to enable next-day shipping on most orders. Big Data makes these digitally enabled warehouses possible by automatically managing stock, preparing for demand, and planning last-mile fulfillment. By connecting warehouse management software data with the wealth of trucking information in GPS logs, big data analytics software can even allow warehouses to plan for traffic, weather, and more. The technology advantages companies have now will influence their market prominence (and maybe dominance) in the years to come. Nowhere is this more true than in warehousing. However, not every company can augment their warehouse footprint or undertake a massive software or hardware upgrade. A number of leading companies are finding partners along the supply chain to help. From 3PL companies to freight-forwarders to intermodal transport experts, supply chain professionals have a lot of options to work with. Want to turbo-charge your supply chain? We’re your partner at the Port of Los Angeles.